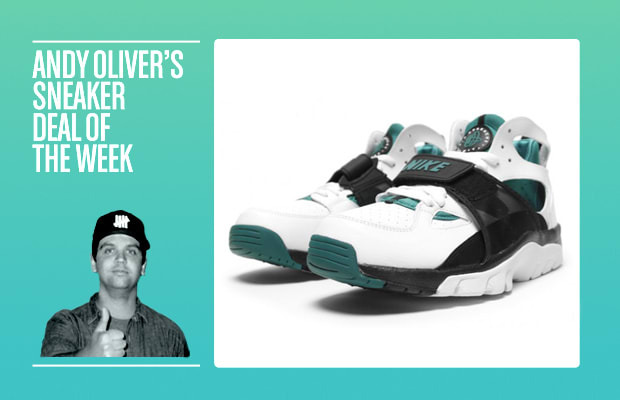 Andy Oliver's Deal of the Week: Nike Air Trainer Huarache "Freshwater"
Andy says: "The Huarache Trainer originally landed at the height of Bo Jackson/cross-trainer hysteria. Despite a whole lot of competition in the early 90s, this sneaker remains memorable 20 years later. Earlier this year a few retro colorways dropped, and despite being a very strong look, hung around long enough on store shelves to find themselves deeply discounted. This week&apos;s sneaker deal finds the Nike "Freshwater" Huarache Trainer available for just $69. That&apos;s a great price for a piece of sneaker history."